Southern Mom Loves: Spoilers Inside! FabFitFun Fall 2018 Box + a $10 Discount Code! Spoilers Inside! 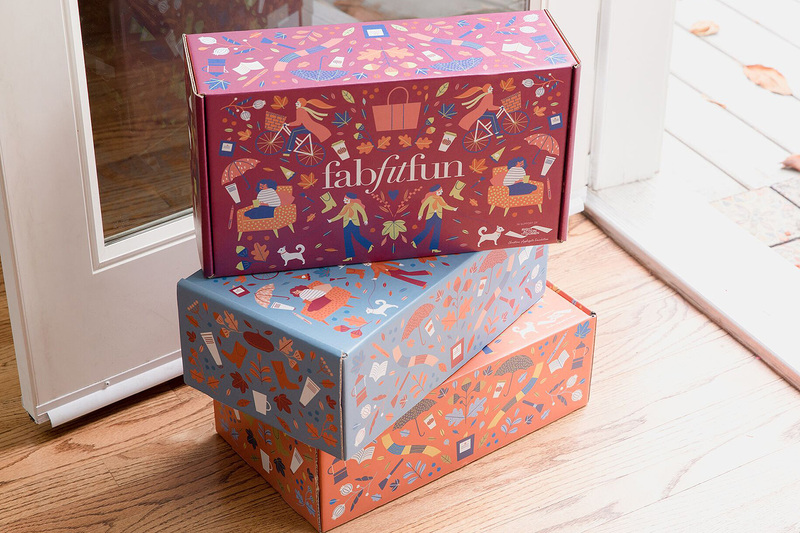 FabFitFun Fall 2018 Box + a $10 Discount Code! I mentioned in my last post that I went a little subscription box crazy, and one of the boxes I ordered was the FabFitFun box. 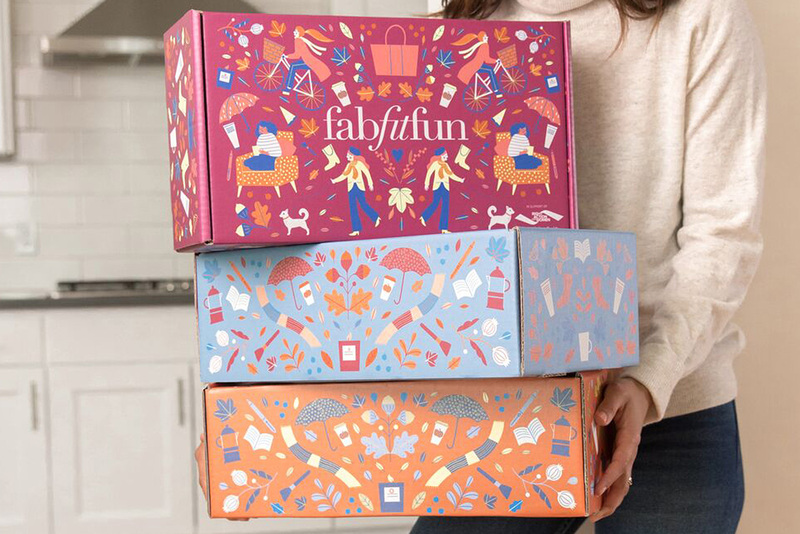 FabFitFun is a box full of finds in beauty, wellness, fashion, and fitness, delivered once per season. I'll be starting with the Fall 2018 box. You would usually get to customize your box, but I missed the customization window, so it will truly be a surprise as to what I receive. Having said that, I do have some spoilers as to what might and some things that will definitely be in my box. Keep reading for SPOILERS, and if you want to take this journey with me, I've got a $10 discount code for you! I've been looking for more fun subscription boxes to try out and this one was right up at the top of my list. The thing I like most about this box is that it's such a wide array of products and not just beauty, fashion, or fitness and that everything inside is a full-sized version, where applicable. After viewing some of their past boxes, I was pretty excited. 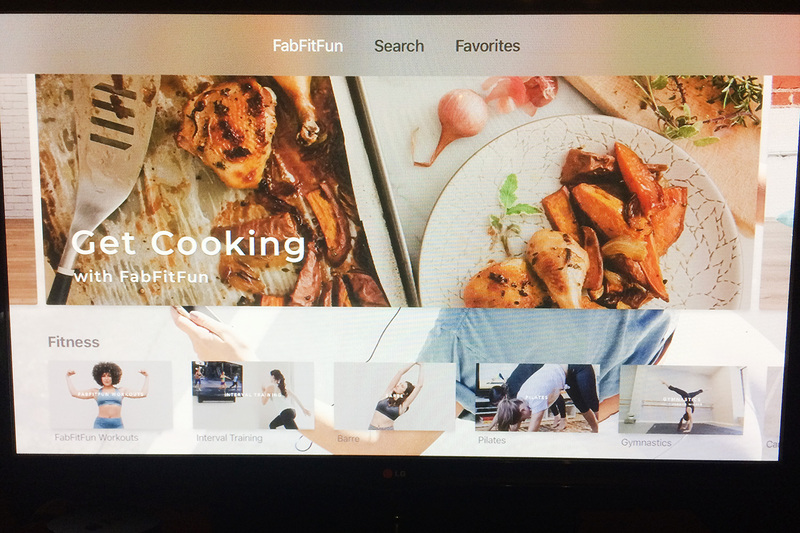 When I ordered, I received an email that I had access to FabFitFunTV. It's full of videos for workouts, recipes, and tips. I saw that they have an app for the Apple TV and Amazon Fire, so I downloaded the app and I have to say this might be one of the most awesome perks of a subscription box ever. It has video series for Pilates, Barre, Dance, Cardio, Gymnastics, Boxing, Toning, Yoga, Meditation, and more. There are also videos for Cooking, Cocktails, and Tips & Tricks for the items in your boxes. I've been trying a new workout or yoga session every day and my daughter loves the dance videos. #1. 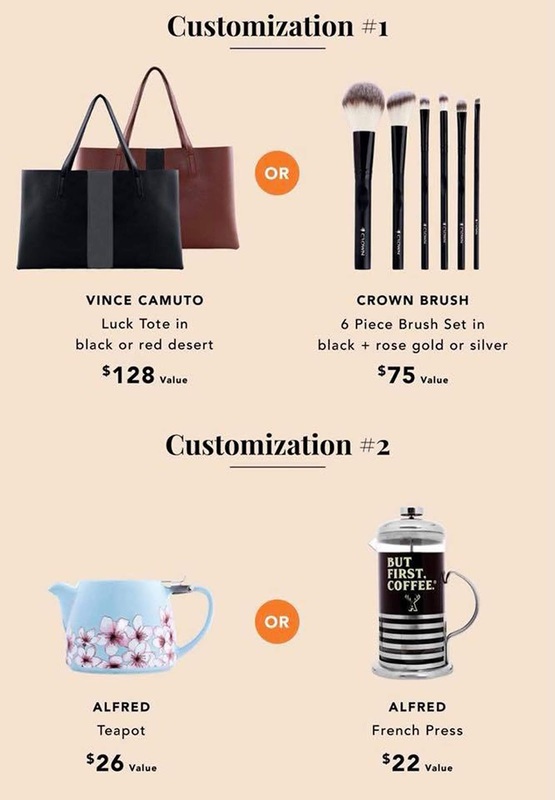 A Vince Camuto Luck Tote in your choice of black or red desert OR a Crown Brush 6-piece makeup brush set in your choice of black and rose gold or silver. #2. A teapot OR a french press, both from Alfred. #3. 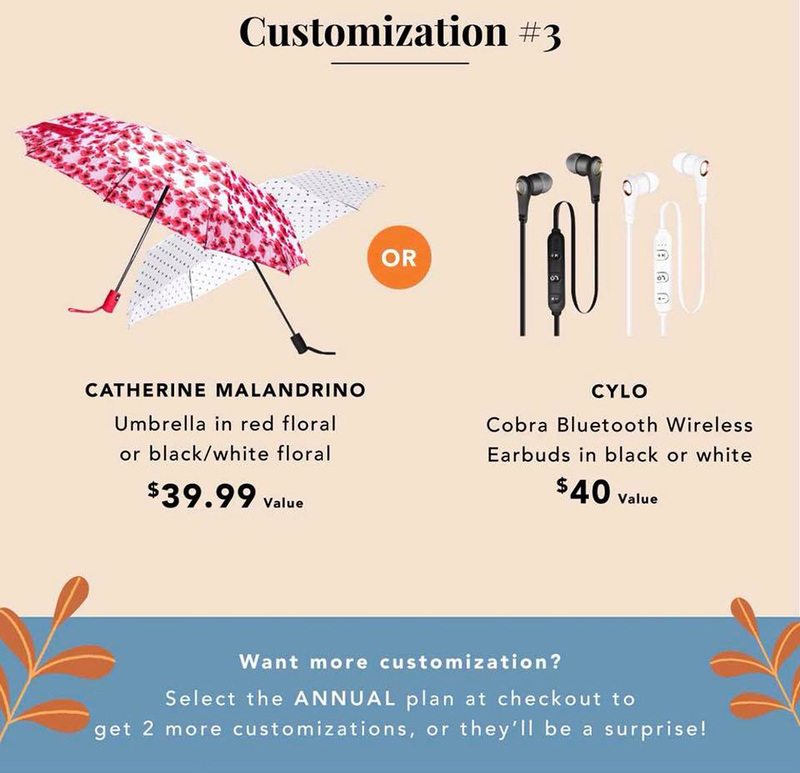 A Catherine Malandrino umbrella in your choice of red floral or black/white floral OR a pair of Cyclo Cobra Bluetooth Wireless Earbuds in your choice of black or white. #4. 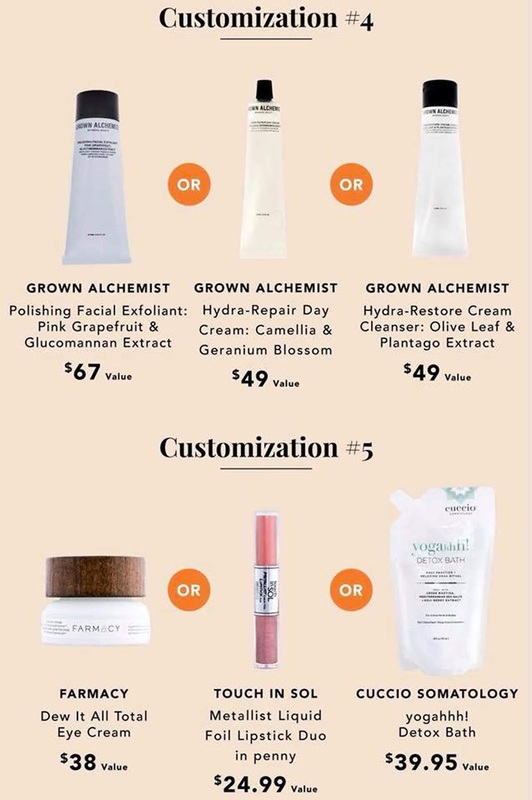 The Polishing Facial Exfoliant OR the Hydra-Repair Day Cream OR the Hydra-Restore Cream Cleanser, all from Grown Alchemist. #5. The Farmacy Dew It All Total Eye Cream OR the Touch In Sol Metallist Liquid Foil Lipstick Duo in Penny OR the Cuccio Somatology yogahhh! Detox Bath. During your box order, you can also add additional items to your box at a discount. If that's not enough, they have members-only edit sales after the boxes ship where you can shop from 100+ products and 30%-70% off retail. All in all, I'm pretty excited and the price of the box ($49.99/month) is way less than the value of the items that I'm receiving, all of which I'm excited to get. 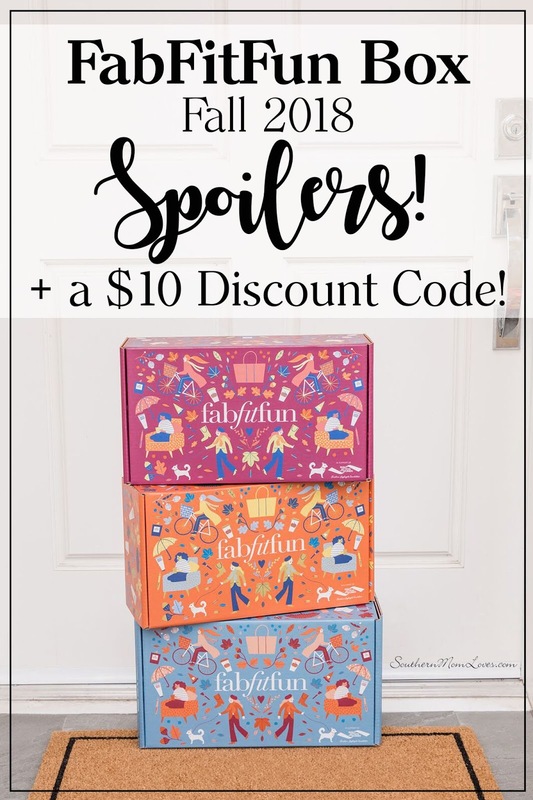 To get $10 off of your first box (makes it $39.99!) click this link--> https://t.fabfitfun.com/SH2Lq, click the 'Get the Box' button and add the code FALLINLOVE in the Promo code box to get your discount! As of now, the Fall box is still available. Once they ship, you'll only be able to get the smaller Fall Edit box until the Winter boxes are released. This one will be coming my way near the end of September, so I'll do an unboxing as soon as I get it! Have you heard of FabFitFun? What are your favorite items from the Fall box? I love to read your comments!